What Do You Want To Buy At 12Buy.sg? Local IT retailer Challenger Technologies knows a thing or two about selling consumer electronics and computer products – after all, it’s been around since 1984 and has grown to over 22 stores island-wide. The company is now extending its reach online, and is hoping that Singaporeans will take to buying from its newly-launched, and the country’s first mass category lifestyle shopping portal, 12Buy.sg. In late 2009, Challenger noticed the gap between the growing trend of online shopping and the lack of established local shopping websites offering safety and security for customer transactions. 12Buy.sg – as in one-two buy, or ‘want-to-buy’ – was their answer. The site stocks a wide variety of lifestyle and IT goods – around 5,000 SKUs across five categories in men, women, kids, home and IT – and leverages Challenger’s retail know-how and vendor networks. 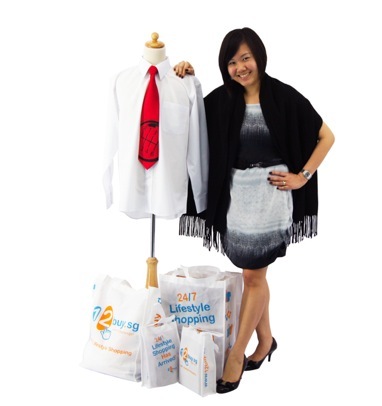 “Singaporeans always want to snag a good buy so we try to stock something for everyone,” says Loo Pei Fen, Challenger Technologies‘ assistant e-commerce director – 12Buy.sg‘s ‘head shopper’ – and a self-confessed online shopping addict. She adds that local shopping websites tend to be rather niche and offer very specific product categories, such as only women’s wear, or only women’s accessories, so they decided to enter the online shopping sphere by setting themselves up as a one-stop online shop that fulfills all lifestyle needs. Security was a major consideration for 12Buy.sg. The site promises shoppers a safe and secure online shopping experience with their credit cards – Visa, MasterCard or JCB – with 3-D Secure authentication protocols to reduce or eliminate credit card fraud. Of course, it also helps that the site is backed by the Challenger brand, which gives online consumers more confidence – after all, you never know which online sites are fly-by-night scams. One of the reasons why Challenger decided to open up so many categories beyond IT products was because they recognized that there are many products around the world that are simply not available locally. “If we were to have limited ourselves to simply offering IT and PC product offerings, we wouldn’t have been able to bring it so many unique goods sourced from around the world which aren’t found in the local malls,” says Pei Fen. For example, amongst its offerings are many green products, such as an environmentally-friendly children’s furniture from Green Lullaby, of which 12Buy.sg is the sole retailer in Singapore. “(We want to be) a ‘green’ website that is passionate about conserving the earth and playing its part for Mother Nature by offering a vast range of eco-friendly goods, and even ensuring its delivery services are done the eco-friendly way, through environmentally friendly bags,” shares Pei Fen. And some Singaporeans are taking the green message to heart – Pei Fen says that their Green Toys series and Bambu cutlery sets are doing very well. “Here we see a trend of consumers who are taking steps towards being earth-friendly while remaining chic doing so,” Pei Fen beams.